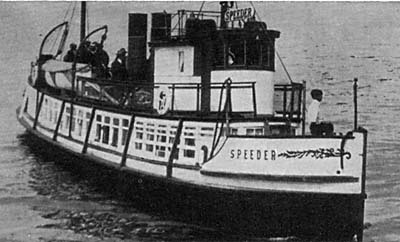 The Speeder was built in Seattle, WA in 1908 as a gasoline powered passenger launch certified to carry 100 passengers. She was originally named the Bainbridge and was 79 feet long and 39 gross tons. She was advertised as the fastest vessel ever constructed. In 1922, she was rebuilt to 87 feet (LOA), repowered with a 90 HP diesel engine and renamed the Speeder. Captain Norman Drigge ran the Speeder between Bellingham, Anacortes and many of the San Juan Islands (Shaw, Orcas, Stuart, Friday Harbor). In the late 20's and 30's, the vessel changed hands several times and was eventually shortened to 77' in order to remove a rotten transom. Most of the cabin was removed and the boat was used to ferry workers back and forth to the shipyards on Habor Island. In her later years, she was anchored out and abandoned at Reid Harbor, on Stuart Island. There, Rev. Ted Leche used her as a chapel for Sunday evening services for the residents of that remote island. She eventually sank from neglect and is still sitting on the bottom of Reid Harbor, a largely forgotten, but very interesting bit of Washington State History. The Speeder was relocated by Jeff Carr and Scott Boyd in the summer of 2008 in 25 feet of murky water. Reid Harbor does not get much tidal flow, and the high nutrient loading means lots of algae growing and lots of silt. Visibility in the summer is usually only about five feet. Turn Point wall, which is right around the corner is a much better dive site (one of the best wall dives in the Northwest), so diving the Speeder would be something best saved for a stormy day when you are stuck in Reid Harbor (which is a stunning location), with nothing better to do! 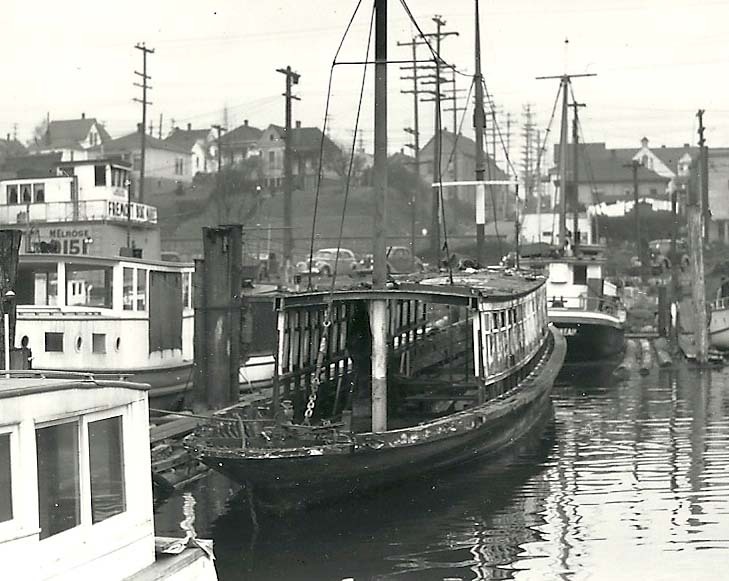 The photo below (courtesy of Fremont Boat Company), was taken in about 1938 shows the Speeder stripped down for carrying shipyard works back and forth to the Harbor Island Shipyards. Location: Reid Harbor at Stuart Island, San Juan Islands. Depth: 25-30' Hazards: Very Low Visibility, lots of pleasure boats.